Share the throne of Egypt with one of the most infamous rulers in world history. Click here to play! You can live in the lap of ancient luxury alongside Cleopatra while collecting jewels and deciphering hieroglyphics. As a ruler of ancient Egypt, you are responsible for helping Cleopatra oversee her kingdom. She not only pays out up to 10000 times your original line bet but Cleopatra doubles any other winning combination if she appears in the line. Collect two or more jeweled beetles and you will be generously rewarded with up to 1000 times your original wager. Five Egyptian Eyes will pay out 1000 times your original wager. Of course this is doubled should Cleopatra make an appearance. The pyramid acts as a scatter icon and three or more anywhere on the board will reward you with free games. If you spin two or more of these icons anywhere on the board, your total bet will be multiplied accordingly. Take a trip along the Nile to rule ancient Egypt with Cleopatra to win her gold. Two to five Pyramid icons anywhere on the board will multiply your total bet respectively. 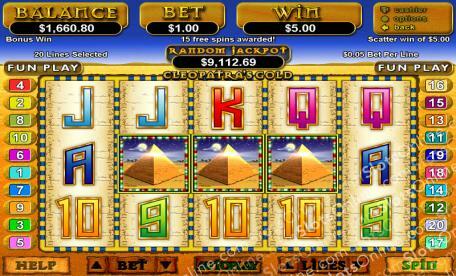 Three or more Pyramids anywhere on the board will start a bonus in which players receive 15 free games. During this feature all prizes are tripled. Cleopatra is an elegant beauty with a golden band around her braided, jeweled hair. She substitues for all other symbols except for the scatter icons. Five or more Cleopatras pays out 10000 times your original line wager.